Can Wonder Woman Save the Sinking Summer Box Office? Many times, movies that open in the first weekend of June, following the Memorial Day weekend, take a big hit, since the winner of the Holiday usually repeats in its second weekend. That definitely won't be the case heading into this weekend, with Pirates of the Caribbean: Dead Men Tell No Tales and Baywatch both underperforming. Audiences' lack of interest in this sequel and TV show adaptation resulted in the worst Memorial Day box office weekend since 1999. That puts even more pressure on Warner Bros.' Wonder Woman to not only revitalize their DCEU franchise, but also kick start the summer box office as a whole. We're predicting that it should have no trouble beating both Pirates of the Caribbean 5 and fellow newcomer Captain Underpants: The First Epic Movie to take the top spot with a projected $94.6 million. This projection is ultimately higher than most of the Wonder Woman box office projections, which pegged the movie at opening anywhere between $65 million and $80 million, although there were analysts who put the movie's debut as high as $105 million. Since then, there has been an influx of highly-positive early reactions, and now the official reviews have started rolling in, with the movie scoring an incredible 96% on Rotten Tomatoes, with 54 positive reviews so far and just two negative takes. As of now, Wonder Woman's only competition, 20th Century Fox's animated adventure Captain Underpants, doesn't have enough reviews for a Rotten Tomatoes score. Box Office Mojo reports that Wonder Woman is expected to open in more than 4,000 theaters this weekend, with Captain Underpants opening in roughly 3,300. While Wonder Woman won't ultimately best the opening weekends of the DCEU's first two movies, it was never expected to. Batman v Superman: Dawn of Justice debuted with an impressive $166.1 million last March, which represented almost exactly half of its $330.3 million domestic take ($873.2 million worldwide) from a $250 million budget. Suicide Squad put up a $133.6 million opening weekend which represented 41.1% of its domestic total of $325.1 million ($745.6 million worldwide) from a $175 million budget. 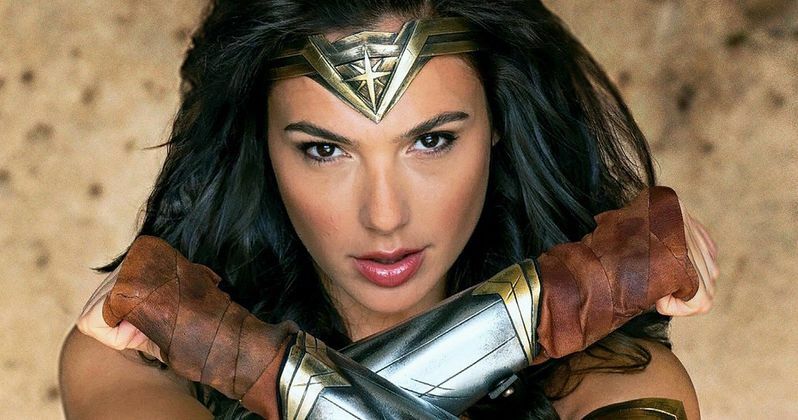 While no budget numbers have been released for this Wonder Woman movie, its 96% RT score is astronomically better than Batman v Superman (28%) and Suicide Squad (25%), so while it may not have a bigger debut than its predecessors, it may have more longevity in theaters. Before she was Wonder Woman (Gal Gadot), she was Diana, princess of the Amazons, trained to be an unconquerable warrior. Raised on a sheltered island paradise, Diana meets an American pilot (Chris Pine) who tells her about the massive conflict that's raging in the outside world. Convinced that she can stop the threat, Diana Prince leaves her home for the first time. Fighting alongside men in a war to end all wars, she finally discovers her full powers and true destiny. The supporting cast is rounded out by Connie Nielsen, Robin Wright, Ewen Bremner, David Thewlis, Danny Huston, Elena Anaya, Lucy Davis and Said Taghmaoui. Patty Jenkins (Monster) directs from a script by Allan Heinberg, based on a story he created by Zack Snyder and Jason Fuchs, and the Wonder Woman character created by William Moulton Marston. We're predicting that Captain Underpants: The First Epic Movie will take third place this weekend with $18.5 million. The story centers on two overly imaginative pranksters named George (Kevin Hart) and Harold (Thomas Middleditch), hypnotize their principal into thinking he's a ridiculously enthusiastic, incredibly dimwitted superhero named Captain Underpants. The voice cast also includes Ed Helms, Nick Kroll, Jordan Peele, Kristen Schaal, Brian Posehn and Mel Rodriguez. The top 5 will most likely be rounded out by Guardians of the Galaxy Vol. 2 ($10.8 million) and Baywatch ($9.7 million). We're projecting that the top 10 will be rounded out by Alien: Covenant ($6.2 million), Everything, Everything ($3.4 million), Diary of a Wimpy Kid: The Long Haul ($2.6 million), Snatched $2.1 million), King Arthur: Legend of the Sword ($1.8 million). Also opening in limited release will be Pantelion's comedy 3 Idiotas, IFC's comedy Band Aid, CBS Films' dramatic comedy Dean, Well Go USA's action film God of War, Purdie Distribution's drama Love, Kennedy, Instrum Int's comedy Opening Night, Samuel Goldwyn Films' foreign film Past Life, Entertainment Studios' sci-fi movie The Recall and Vertical Entertainment's crime drama Vincent N Roxxy. It isn't clear if any of these films will expand into a wider release in the weeks and months ahead. Looking forward to next weekend, Universal Pictures will unleash The Mummy remake in theaters, alongside A24's indie thriller It Comes At Night and Bleecker Street's drama Megan Leavey. Also opening in limited release is Roadside Attractions' comedy Beatriz At Dinner, The Orchard's dramatic comedy The Hero, Freestyle Releasing's drama Miles, Fox Searchlight's romance My Cousin Rachel and Oscilloscope Pictures' documentary Night School. Take a look at the projected top 10 below for the weekend of June 2, and check back on Sunday for the top 10 estimates.